Rihanna brings in the season of the fish with a bang. Not only is she rocking a hot pixie cut, but she is serving casual glam. Yaass honey... She is giving you full frontal with a bare gorgeous neutral face. There aren't many that can pull off this look, but Rih-Rih has a bone structure that won't quit. Now we all know that Pisces are all about creativity and this "badgalriri" will goes against "the grain" and will put the fashion society in an uproar on whether her looks are right or wrong. However, when you accept yourself for who you are, the way Miss Fenty does, it is hard to go wrong with the most risque fashion choices. I must say that it is very rare that I ever disagree with any of her fashion choices. She gives off creative fashion energy even when she chooses to wear pajamas and no bra. Who's going to check Rihanna boo? Yeah, I must say that I am pleased to share a season with one of fashion's greatest icons. Rihanna has not only become notable for her music and fashion, collaborating with River Island for a fashion line; she continuously sells out with her cosmetic line, in which she has paired with MAC cosmetics. Rihanna also share a place with us in The Solo Alliance, happily single, although the numerous rumors about who she is with, Rihanna hasn't claimed anyone and is living a single lifestyle and has spoken about how she is thoroughly enjoying the single life. 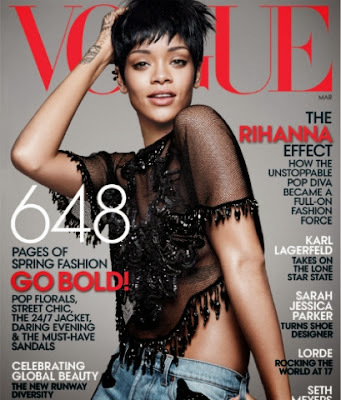 Lets put our glasses up for Miss Rihanna slaying yet another prestigious Vogue cover. Check out more of Rihanna's Vogue Covers below (not in chronological order). Are you in The Solo Alliance?